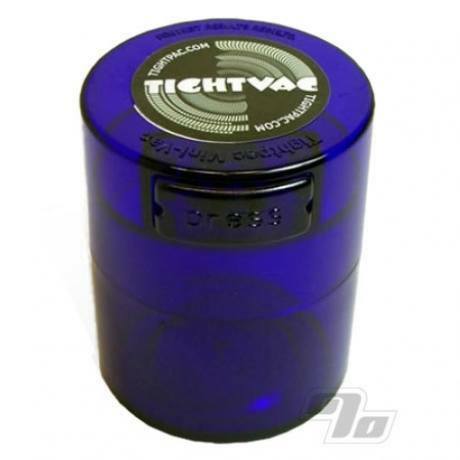 Cobalt Tinted Tightvacs also protect against light, bugs, rodents and roommates. The possibilities are endless... Did we mention that these ergonomic containers are Smell Proof? The dark tightvacs are always out of stock, so I was glad to grab this one. I made sure to test it a few times to make sure it doesn't open on its' own and it seems to work great. The darker color is beneficial for those using it to keep materials whose medicinal qualities break down faster when exposed to light. I will probably buy more when available. A little smaller than I expected but no problem, works out perfectly. Great to keep your stash in, and a good size. It is kind of cheap and will get beat up easily. so don't drop it! Definitely kills the smell. It keeps the smell inside and my herb fresh. Great for eliminating the skunky smell. Excellent product. I bought 2 of them. These tightvac containers are perfect for moderate amounts of green. Nice looking too.